MTA Community-Wide Thanksgiving Learning Program Do You Wonder Y? 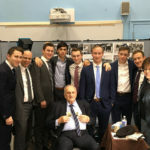 MTA talmidim who participated in last year’s Names, Not Numbers elective course, were fortunate to meet Holocaust Survivor Dov Landau on their trip to Poland. This year, Mr. Landau flew in from Israel to be interviewed today by current Seniors for their Names, Not Numbers documentary. He also shared his story with our entire Junior and Senior Grades. Mr. Landau’s remarkable story of survival includes losing his entire family, performing harsh labor in 5 different concentration camps, the Death March, and saving the life of a little 8-year-old boy named Lulek in Buchenwald, who later became Chief Rabbi of Israel Rabbi Yisrael Meir Lau. Mr. Landau’s story continues after the Holocaust in Israel, where he joined the army and was captured by Arabs on the same day that Israel declared independence. Mr. Landau was a Prisoner of War in Jordan for 11 months, until he was finally freed and returned to Israel, where he still resides. Mr. Landau kept the promise he made to his dying father to remain Jewish if he survived the Holocaust and has dedicated his life to sharing his story, part of which is documented in the movie Exodus. A renowned speaker and Holocaust expert, Mr. Landau presents at conferences and events across the globe, in addition to serving as a tour guide for groups visiting Poland and the concentration camps. Our talmidim look forward to helping Mr. Landau spread his message of survival and hope through the Holocaust documentary they are creating.